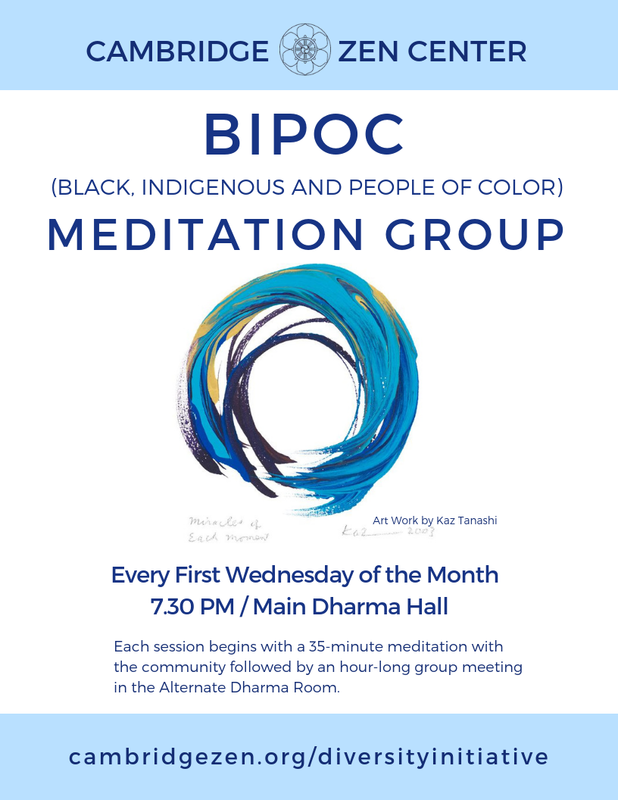 The Cambridge Zen Center would like to invite those who identify as BIPOC (Black, Indigenous, and/or People of Color) and/or of mixed race heritage to come sit together on the first Wednesday evenings of the month. The program will include Zen meditation together with the larger community followed by an hour long BIPOC-only dharma sharing circle. Within this practice group, BIPOC can temporarily put down the experience of marginalization and nurture relationships and trust in a space held through shared experience and common understanding. It will be an opportunity for BIPOC-identifying sangha members to strengthen connections to oneself as well as to one another, and to nourish a sustainable and enduring spiritual practice. By supporting ourselves and our practice in a BIPOC-defined space, we are able to engage as members of the sangha at large more fully and authentically. Please join us on the first Wednesday of the month at 7:30 PM for regular meditation in the Main Dharma Hall with the rest of the community until 8.05 PM. We will then meet as a group for dharma sharing and a circle talk in the Alternate Dharma Room. Non-BIPOC members who are interested in discussing the impact of race on their own lives are encouraged and welcome to attend the Unpacking Whiteness Meditation Group where some of these issues, including possible feelings of exclusion from the BIPOC group, will be unpacked further.